The formula “the word of the Lord” is of paramount importance to who we are as the people of God. Without this formula Christianity simply becomes a collection of well thought out doctrines without divine power. It appears Eleven times in Acts, Seventeen times in the New Testament, only once of which is a direct quote from the Hebrew Scriptures ( 1 Peter 1:25 ). It appears Thirty two times in the Minor Prophets and constitutes the very base of their message and core of the authority by which they spoke. Unfortunately it is very clear that this formula was also utilized by those who spoke falsely, for personal gain or from fertile imagination, often without immediate repercussions. This formula is used Nine times in the Pentateuch. Twice it refers to a personal message from God to Abraham. Twice it refers to those who feared or respected God through his messenger Moses. Three times it refers to the specific will of God concerning a situation and then twice it is used to denote the general commands of God. In all cases it is something that should be greatly respected, immediately and continuously obeyed and contains the combination of promise and consequences involved in obedience or disobedience. Those who have carried this Word have been dismissed, ignored and persecuted throughout history. So rarely have they been embraced as to almost make it suspect when the general public (even of the People of God) embrace their words. Today the lack of respect continues even within the church in a land where we have more Bibles per capita than perhaps ever in the history of the world. We quibble about translations. We reject inspiration. We modify to fit our experience and common choices. Can the end be any different from those who throughout time have rejected the very authority of the Word of the Lord? For Hosea the entry of the Word of the Lord to his world was a life changing proposition. This was true through out the Bible and continues to be true today. If one were to research each of the biblical references for this formula I am guessing that one would find someone whose life was changed. This would indeed be the case for our protagonist Hosea. He was about to embark on a life journey which would express the heart of God and the depth of His plan for the salvation of a lost world. It would be an embarrassing and difficult journey. Disrespect for the Word of the Lord is nothing new. False prophets, crazy prophets and mistaken prophets clouded the vision of God’s people then even as they do now. Skeptics doubted and the intellectual explained away the impact of God on Israel, relying instead on the might of nations, the power of wealth and the scheming of men to preserve the nation. Hosea had a Word of the Lord for them. Αγαπη, Such a simple word from a relatively simple language. How much God has packed into these 5 Greek letters! (Ok for the Greek scholars out there most of the forms actually used in Scripture have more than 5 letters). Quick numbers that I picked up from various sources show that AGAPE and its forms are used over 200 times in the New Testament. Of course the Old Testament was not written in Greek but when they translated the Septuagint (probably 3rd century) they used this word over 300 times. There have been uncountable numbers of sermons, teachings, devotionals and studies done on this word. It is featured prominently in the names of churches, ministries, books, articles and music. One would think that with its great prevalence in the literature and arts of the Christian world that it would be something that we do well… or not. I could go on over 200 times and then start on the Old Testament references but I think that you get the idea. With so many teachings out there on this subject my purpose is not to create a new word study here. Perhaps it is just to refocus myself on an aspect of our Faith that is so key to the ministry that God has called me too. So I just want to pick out a couple of things that stand out to me. 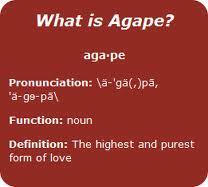 Agape involves being called and being sent. Over and over the Love story that is our Scripture tells us of God calling people out of their comfort zones to be his hands and feet of Love. Abraham, Moses, Gideon, David, The Disciples and Paul were all called out of their own lives and comfort zones in order to experience and to exhibit this quality. “1 Therefore if there is any encouragement in Christ, if there is any consolation of love, if there is any fellowship of the Spirit, if any affection and compassion, 2 make my joy complete by being of the same mind, maintaining the same love, united in spirit, intent on one purpose. 3 Do nothing from selfishness or empty conceit, but with humility of mind regard one another as more important than yourselves ; 4 do not merely look out for your own personal interests, but also for the interests of others. 5 Have this attitude in yourselves which was also in Christ Jesus, 6 who, although He existed in the form of God, did not regard equality with God a thing to be grasped, 7 but emptied Himself, taking the form of a bond-servant, and being made in the likeness of men. 8 Being found in appearance as a man, He humbled Himself by becoming obedient to the point of death, even death on a cross. Thirdly, AGAPE involves obedience to the one true source of love in the created realm, God the Father, God the Son, God the Holy Spirit. While these three aspects certainly are not an all encompassing examination of AGAPE, they are certainly a great place to start.